»Culture & Arts»Next Great Club GASS Night – January 25th – at the Róisín Dubh! Next Great Club GASS Night – January 25th – at the Róisín Dubh! What would the New Year be for the LGBT+ community without being able to let your hair down at the fabulous Club GASS night in Galway? 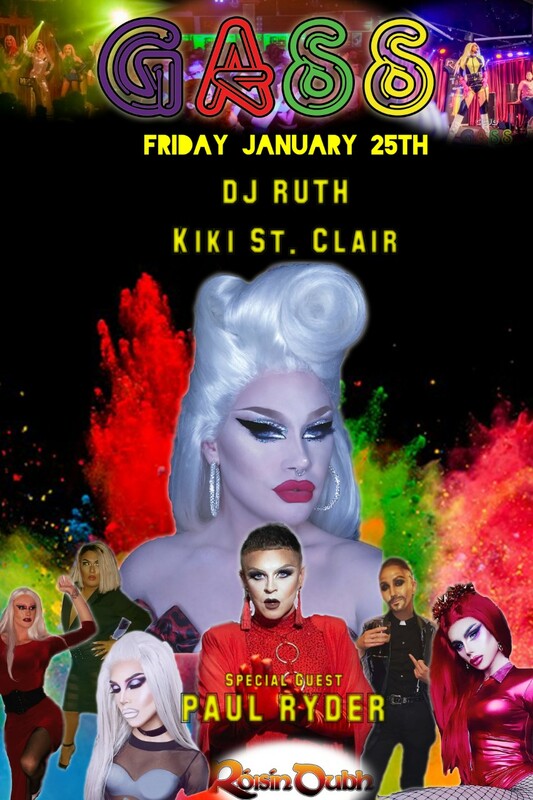 Coming up on January 25th is the next big club night, with Miss Kiki St Clair as the hostess with the mostest, and the discs will be spinning wildly with DJ Ruth at the helm. All your favourite and famous Club GASS girls will be there, and there will, of course, be a special guest on the night, and that is the very talented Paul Ryder, for your amusement and entertainment. The venue is the rather salubrious Róisín Dubh, on Dominick Street, in Galway, and DJ Ruth kicks it all off at 11.30pm. If you haven’t been to Club GASS before, go along on the 25th, you’ll have a blast, make some new friends, and forget all your new year’s resolutions!